A Hawaiian chef is attempting to set the Guinness World Record for the rice, beef, and egg dish. There is something vaguely revolting yet oddly irresistible about giant-sized food. And that’s why we’re strangely fascinated by this vat of loco moco that’s big enough to bathe in. The oversize Hawaiian dish of rice, beef, egg, and a gravy was assembled by a team led by Hideaki Miyoshi, a chef at Tokkuri Tei restaurant in Honolulu. The group claims it’s the largest ever made, and has submitted their loco moco to Guinness World Records for adjudication. Loco Moco was invented in Hilo, Hawaii in the late 1940s; the origin tale is that a local restaurant created the cheap, filling dish for the teenage football players that used to hang out there. Although there are plenty of variations, the basic recipe consists of white rice topped with a burger patty, fried egg, and gravy—sort of a fast-food version of a bibimbap. To create this 1,126-pound world record attempt, Miyoshi reportedly used 600 pounds of rice, 200 pounds of ground beef, 300 scrambled eggs, and 200 pounds of gravy. 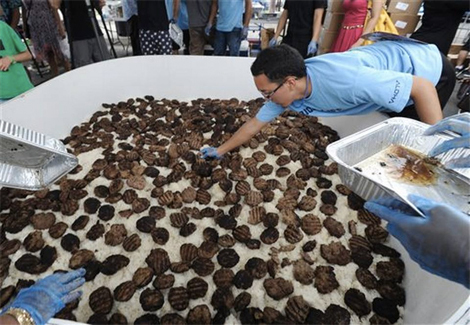 Associated Press reports the dish took three and a half hours to prepare at Honolulu’s Fifth Annual Rice Festival, the second record-breaking dish to be assembled there. (In 2011, Edward Sugimoto claimed a title for his 286 pound Spam musubi, a block of rice topped with Spam and wrapped in nori seaweed). This gigantic loco moco was donated to charity after the festival in order to feed the homeless, although we have no idea how they moved it.